The CALCASA Campus Program works with college and university campuses across the U.S., Guam and Puerto Rico that are funded by the U.S. Department of Justice Office on Violence Against Women to reduce sexual assault, domestic/dating violence and stalking. Today, we are featuring a guest blog post about one of the 123 institutions we provide technical assistance to highlight the innovative campus and community-partnerships in response to and prevention of sexual violence on campuses. UC Merced received a grant for nearly $45,000 from the Verizon Foundation to support a domestic violence prevention program aimed at college students. The grant supports the administration of the Know Your Power Bystander Social Marketing Campaign developed by researchers at the University of New Hampshire. The translation of the Know Your Power Bystander Social Marketing Campaign for the UC Merced Campus was a collaborative project of the Violence Prevention Program Director, Kari Mansager, UC Merced’s Associate Vice Chancellor of Student Affairs, Charles Nies, and the University of New Hampshire researchers. The Know Your Power campaign helps prevent domestic violence, sexual violence, and stalking by instructing community members to take an active part in stepping in and speaking up against these crimes. Community members are encouraged to interrupt situations that could lead to assault or during an incident, speak out against social norms that support sexual violence, and have skills to be an effective and supportive ally to survivors of violence. Student involvement has been an important part of the development of the Know Your Power Bystander Social Marketing Campaign. During the spring 2011 semester, over 250 UC Merced students were recruited to participate in focus groups to develop the four scenarios featured in the Know Your Power campaign. The scenarios portray typical college scenes that explicitly model safe and appropriate bystander behaviors in the prevention and intervention of domestic violence, sexual violence, and stalking. The bystander social marketing campaign includes displaying posters across campus, free products with the Know Your Power logo to all first-year students, bookmarks distributed in student bookstore orders, dining hall table tents, a customized interactive website, digital displays and more! The campaign will be displayed from late August until early October on the UC Merced Campus. UC Merced is working with the University of New Hampshire to evaluate the effectiveness of the campaign and plan to share the evaluation findings in spring 2012. 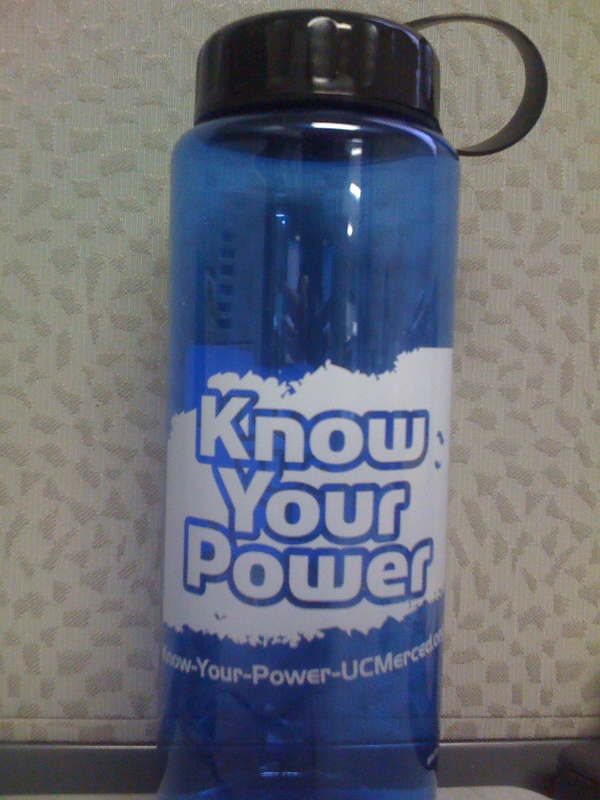 To view the campaign images, visit www.know-your-power-UCMerced.org. Livia Rojas, MSSW, is the Training and Resource Coordinator in the Campus Program at the California Coalition Against Sexual Assault (CALCASA) where she provides training and technical assistance to recipients of the Department of Justice (DOJ), Office on Violence Against Women (OVW) Grant to Reduce Domestic Violence, Dating Violence, Sexual Assault and Stalking on college and university campuses across the United States and territories. Livia has eleven years of working to advance human rights and student organizing through practice and research.